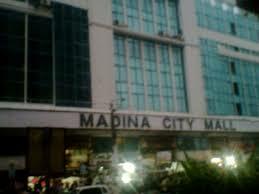 Maadina city mall is a good shopping mall for shopping of monthly grocery at affordable rates. Good variety of grocery items is available. Most of the daily use products are Available under one roof. Good helpfully staff with delivery of purchased items to your car in parking. Parking is generally filled especially at start of month and evening hours. A main clothes shopping hub specially in Saddar area. You get maximum variety in very reasonable price. . All casual and semi-formal readymade garments for women, men and kids are available here. Centrally air conditioned, smoking free mall.